We feel like we say this every year, but wow this winter has been a long one. We’ve cycled through our entire collection of sweaters at least ten times. And our snow boots are pretty much fused to our feet now. Needless to say, we’re more than ready to thaw out in the spring sun. Luckily, we don’t have to wait much longer to do so. This coming Monday, March 20th, marks the vernal equinox (AKA the first day of spring). It’s time to break out the flower crowns and sun dresses because warm weather is about to flood our hemisphere. This girl’s got the right idea. One iced coffee to go, please! During the vernal equinox, most time zones on Earth experience an equal 12 hours of day and 12 hours of night. After this Monday, the days will grow longer and nights shorter in the Northern Hemisphere — that is until the Summer Solstice on June 21st. In astronomical terms, the vernal equinox occurs when the sun is at the intersection of the celestial equator and the ecliptic, also known as the path of the Sun in the sky. But more importantly, this equinox means life is about to get a whole lot sunnier! Brighter! Happier! The winter doldrums will affect us no more! Do you hear us, winter? No more! 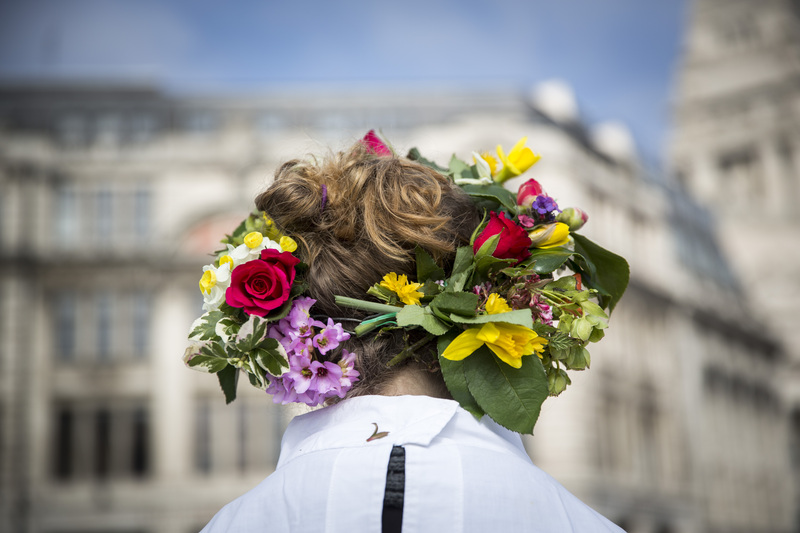 Us humans have been celebrating the first day of spring since ancient times. Spring represents fertility and new beginnings, which are important aspects to keep this whole circle of life going. According to The Provenance Press Guide to the Wiccan Year by Judy Ann Nock, fertility goddesses such as “the Saxon goddess Eostre and her Germanic counterpart, Ostara,” are called upon during pagan or Wiccan ritual and celebration during the equinox. And if you ever wondered where the “egg” thing started in regards to celebrating spring and Easter — not to point fingers, but you can blame almost all of our ancient ancestors. In most ancient societies, eggs represented cyclical rebirth and creation. Like the Christmas tree, the egg symbol was combined with the Christian holiday of Easter later down the road, but was originally used to celebrate the spring equinox. Like those who celebrate Easter, modern pagans still decorate eggs to celebrate the vernal equinox. So if you’re a fan of dyeing eggs, knock yourself out on Monday! Another great vernal equinox ritual to partake in is to bake a yeast-based bread. This process combines the four elements (air from the yeast, fire from the oven, water in the dough, and earth in the flour), which shows your appreciation for nature. But hey, when it comes to celebrating the warm air and long days, you do you! Maybe begin a new tradition of taking a walk with friends through your favorite park. Or hang a “Welcome Back” banner across your front door to welcome spring back into our hemisphere. The celebration options are endless. Enjoy your Monday and give our old pal Vernal Equinox a high five because she’s pretty awesome.